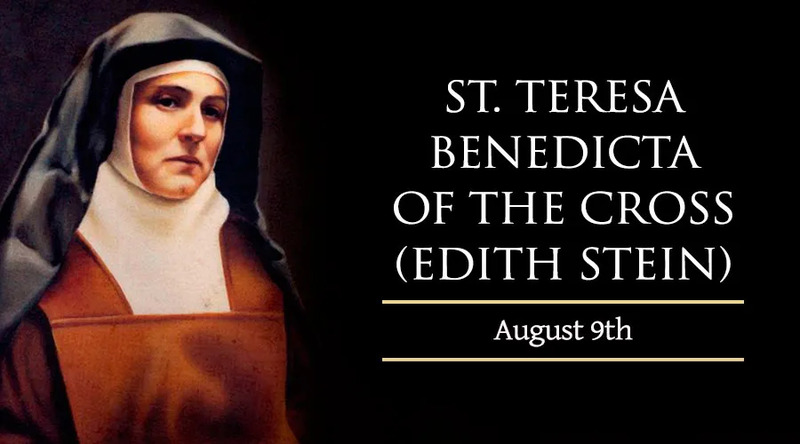 On August 9 the Catholic Church remembers St. Teresa Benedicta of the Cross, also known as St. Edith Stein. St. Teresa converted from Judaism to Catholicism in the course of her work as a philosopher, and later entered the Carmelite Order. She died in the Nazi concentration camp at Auschwitz in 1942. Edith Stein was born on October 12, 1891 – a date that coincided with her family's celebration of Yom Kippur, the Jewish “day of atonement.” Edith's father died when she was just two years old, and she gave up the practice of her Jewish faith as an adolescent. As a young woman with profound intellectual gifts, Edith gravitated toward the study of philosophy and became a pupil of the renowned professor Edmund Husserl in 1913. Through her studies, the non-religious Edith met several Christians whose intellectual and spiritual lives she admired. After earning her degree with the highest honors from Gottingen University in 1915, she served as a nurse in an Austrian field hospital during World War I. She returned to academic work in 1916, earning her doctorate after writing a highly-regarded thesis on the phenomenon of empathy. She remained interested in the idea of religious commitment, but had not yet made such a commitment herself. In 1921, while visiting friends, Edith spent an entire night reading the autobiography of the 16th century Carmelite nun St. Teresa of Avila. “When I had finished the book,” she later recalled, “I said to myself: This is the truth.” She was baptized into the Catholic Church on the first day of January, 1922. Edith intended to join the Carmelites immediately after her conversion, but would ultimately have to wait another 11 years before taking this step. Instead, she taught at a Dominican school, and gave numerous public lectures on women's issues. She spent 1931 writing a study of St. Thomas Aquinas, and took a university teaching position in 1932. In 1933, the rise of Nazism, combined with Edith's Jewish ethnicity, put an end to her teaching career. After a painful parting with her mother, who did not understand her Christian conversion, she entered a Carmelite convent in 1934, taking the name “Teresa Benedicta of the Cross” as a symbol of her acceptance of suffering. “I felt,” she wrote, “that those who understood the Cross of Christ should take upon themselves on everybody's behalf.” She saw it as her vocation “to intercede with God for everyone,” but she prayed especially for the Jews of Germany whose tragic fate was becoming clear. After completing her final work, a study of St. John of the Cross entitled “The Science of the Cross,” Teresa Benedicta was arrested along with her sister Rosa (who had also become a Catholic), and the members of her religious community, on August 7, 1942. The arrests came in retaliation against a protest letter by the Dutch Bishops, decrying the Nazi treatment of Jews. St. Teresa Benedicta of the Cross died in the concentration camp at Auschwitz on August 9, 1942. Blessed John Paul II canonized her in 1998, and proclaimed her a co-patroness of Europe the next year.